Did you know that only 47% of couples take out wedding insurance? 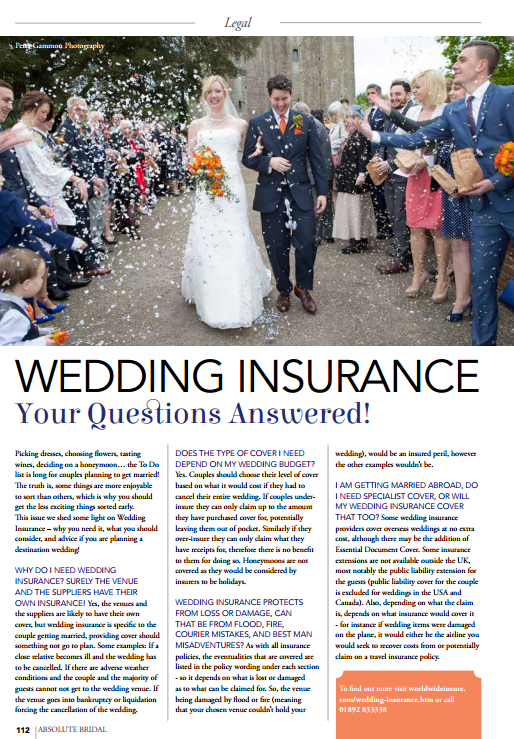 WorldwideInsure.com were recently featured as the voice of expertise in a bridal magazine offering advice on wedding insurance, answering some common questions that brides ask about whether or not they really need the cover. We thought this advice was too good not to share here too. You can read the full article in Absolute Bridal online, page 112, or take a look at our extracts below! Want to know more about getting cover? Get an instant online quote for wedding insurance from WorldwideInsure.com, or call us on 01892 833338. This entry was posted in Travel Insurance, wedding insurance on April 10, 2015 by worldwideinsure.